The resurrection of Jesus is a fulfillment of Israel's longings and the prophet's expectations. Luke seems singularly focused on the empty tomb as what was foretold all along. In the next passage, Jesus will appear to two of Jesus' followers on the Emmaus Road and will open up the Scriptures to them as to his charge foretold long ago. But here as the "two men in dazzling clothes stood beside them," the women are reminded of Jesus' words to them before his death. The plan had been put in place; it was now completed. Unbelief does not mean that people believe nothing. Rather, it means that they believe something else. People say "I don't believe it" because there is something else that they believe more strongly. Yet here is where the Easter message begins its work, by challenging our certainties. Experience teaches that death wins and that even the strongest succumb to it. Experience teaches that life is what you make it, so get what you can while you can because it will be over soon enough. And the Easter message says, "Really? How can you be so sure?" Death is real, but it is not final. In Jesus, life gets the last word. And that is precisely the point-- to say an event represents a fulfillment affirms that someone gets the last word. The naysayers can say what they want-- the religious leaders cynically doing whatever it takes to preserve their daily cultic functions giving in to the Romans and their demands that peace be kept at all cost, and the disciples who insisted that Jesus be a Messiah after their own image and in their own way-- but Jesus' resurrection is a fulfillment, an affirmation that God gets the last word-- and God will bring everything to completion in God's own way and in God's own time. 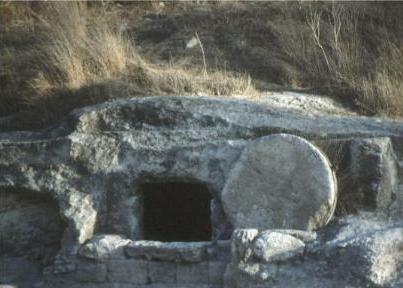 "Remember how he told you..." yes, the tomb is empty... all things have been fulfilled. The risen Jesus gets the last word. "And the disciples who insisted that Jesus be a Messiah after their own image and in their own way", I've never considered this. I appreciate the quote so much. I have read Pannenberg much over the years, and he has helped me understand the importance of the "historical" nature of the resurrection. Here is the basis of Christology and Trinitarian reflection and even the whole notion of Incarnation. Apart from this apocalyptic and Jewish context, I am not sure that much of Christian belief, liturgy, hymns, and songs make much sense. In the midst of death, especially at funerals, I find it particularly gratifying to share that God and life have the final word rather than death. I believe ... but not easily and with difficulty. But then, as you point out, I think we could say the same of the disciples.